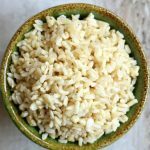 Perfectly cooked brown rice without any fuss made in your pressure cooker in 40 minutes. Turn your instant pot to the “saute” function to start it heating up. Then add in the water and the brown rice and a pinch of salt (if desired). Place the lid on the pressure cooker and turn the valve to sealing. Turn the saute function off and turn to manual for 22 minutes. When the beeper goes off, keep the lid on for an additional 10 minutes and then turn the valve to venting. Remove the lid and the rice should be ready to eat and enjoy! This recipe took a total of about 40 minutes (with warm up time, cooking time, and pressure releasing time).